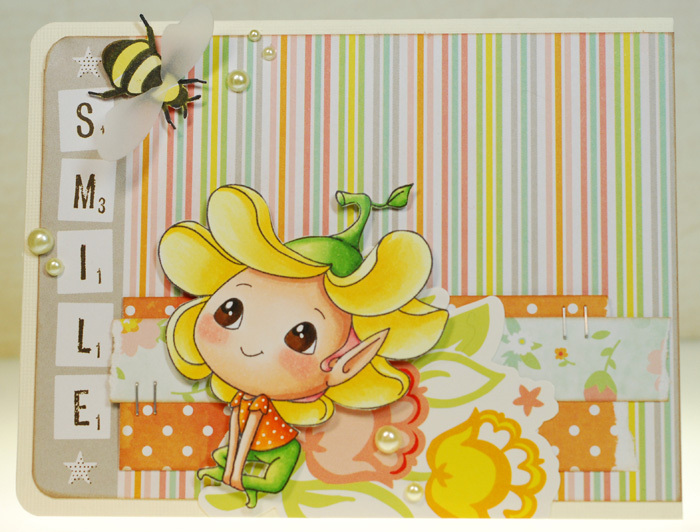 Well, I've got another simple card using up more of the border stickers that were also on my card from yesterday. Paper isn't the only thing that I'm trying to make a dent in my stash of currently. Speaking of which, I can check another un-inked stamp off of my list... yeah! I love this new TGF Miss Anya from the Garland set because of her hair and cute dress but I didn't really need her holding a garland so I did a bit of altering and wiped it and her arms away with a baby wipe before stamping. Then I redrew in the lines of her dress as well as new arms with a Copic multiliner 0.1 pen. I even added some capped sleeves to her dress too so that there would be a bit more color up there. Alrighty friends, I hope you do something fun with this extra day! 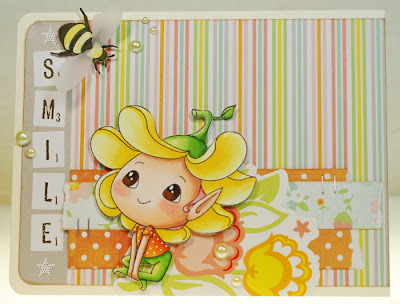 The background is all a "use up scraps" kind of card with bits of this and that thrown together. Nothing mind blowing or new but sweet nonetheless. Ok, I need to go find some caffeine or something to get me going. Ya know how I've been trying to ink up neglected stamps lately? Well I'm proud to say that this little Pure Innocence Blowing Bubbles cutie had a pretty quick turn around because I just got her in the mail on Thursday, so she didn't have to sit and wait for ages. At first I was going to pair her with the soft Neapolitan papers, which I still think would look pretty, but I decided to give those papers a break and play with some brighter colors instead. 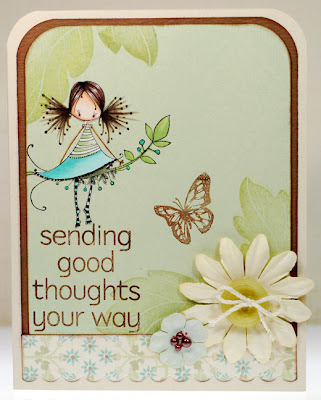 I love the dark denim from the On the Bright Side paper pad even if it does give this card more of a summer feel rather than spring. Nothing wrong with a little bit of summer day dreaming (especially since it tried to snow again yesterday). I paper pieced her outfit and just added some shading to give it some depth. Something about this little gal was calling out for freckles too, so I couldn't resist adding some across her cute face. Then I had fun splattering on those blue droplets in the background from a bottle of Sprinklers. Don't they kind of look like bubbles floating all around her? Alrighty, time for me to scoot. Thanks for stopping by today! Alrighty, I'm off to go play a bit. Have a great one! Hopefully y'all aren't getting tired of seeing more Dear Lizzy papers. 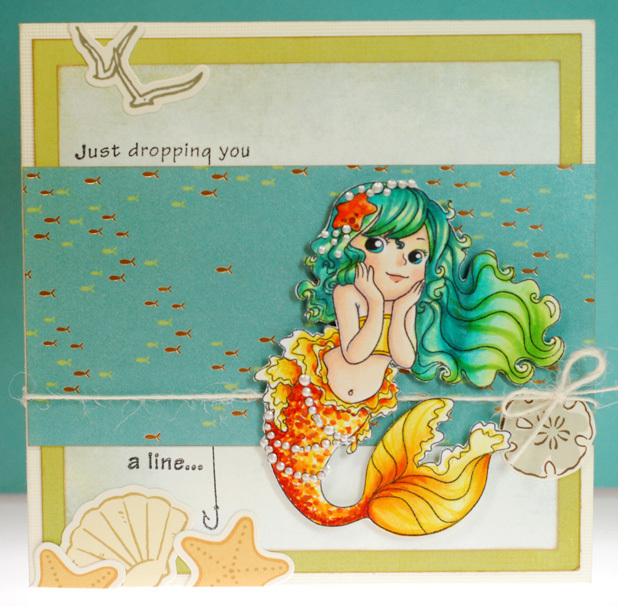 I'm still working with the Neapolitan scraps that were created from the first couple cards I made using them. I just can't stop using this line! But look at the cuteness of that jar... can you blame me? Ok, time for me to sign off... catch ya on the flip side! I new right away that I wanted to make a 'thank you' card as a way to say thanks to everyone who has been participating in the challenges. 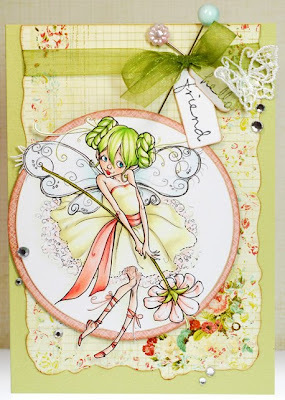 And could you tell that I actually used a Christmas digi on this very spring colored card? Yep, it's Lil Shopping Ivy and I cropped off her arm holding the stocking before printing her out 'big head' style. Then I just colored her up to match more of those gorgeous Dear Lizzy papers and fussy cut her out so that she could look cute on that tag. All in all, pretty simple but a cool effect. Ok, now it's time for you to get creative, check out the amazing inspiration from the rest of the design team girls and play along with us this week. There is a free digi of your choice up for grabs and the winner is selected by random generator! 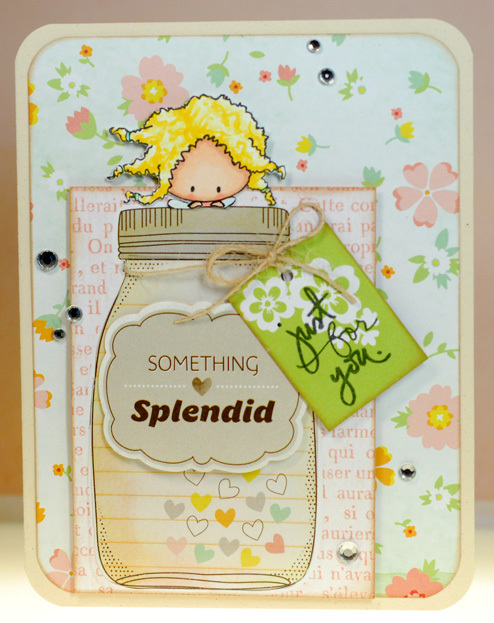 Don't forget that your card must feature a Tickled Pink stamp in order to qualify for the prize. All of which can be found in the Tickled Pink store. 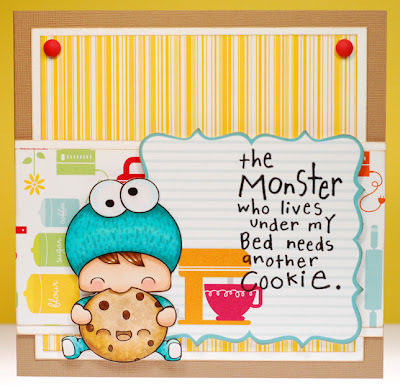 I've got a lot going on today so I'm gonna jump right into the card that I have to share. This card also turned out to be one of the rare occasions when I used stamps to set the scene rather than relying on pattern paper. And Ivy is actually stamped twice, once on the background cardstock and then again on some Copic X-Press It, because I knew that there was no way I would be able to cut out all of the skinny vines, arms and pigtails. This way, all I had to fussy cut was the basic outline of her dress, head and legs. That, and I also got some of the new Dear Lizzy Neapolitan goodies and just had to cut into them right away. Swoon... no joke, these may be my most fave new papers from Winter CHA, they are even more lovely in person than on the computer screen. The colors make me happy just looking at them and I think that Bloom looks right at home amongst them too. Doesn't she look all sorts of bright and sunny? Love it! 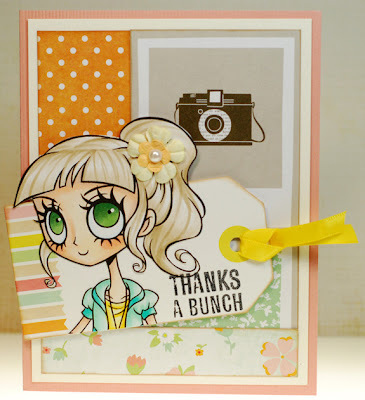 Ok, so there is even more review preview fun and inspiration from the rest of the ATS and Sweet November gals to check out at ATS so be sure to hop on over there too! And all of the new February stamps can be found in the ATS store here! In the end, this one came together just as I had envisioned it and I always love when that happens. Alrighty, I've got a long day ahead of me but it should be a pretty good one so I'm not complaining. Speaking of dreaming... look as this cutie-patootie. Yep, I'm still working my way through inking up stamps that have had to sit and wait and this time it was Emerald Faerie Ashee who made it onto a card. I've loved this little guy for quite some time but had to wait 'til I could buy the stamp stateside and once I did, I was in the middle of Christmas card making season. After that I was busy with other things so he had to wait even longer. But Ashee was ever so patient with me and it was so much fun to finally color him up for a sweet and simple baby card. Well my friends, enjoy the remainder of the weekend and try to keep warm! to my dreams of spring? Seriously, it was not supposed to snow again people! So imagine my surprise (and dismay) when the white stuff started to fall yesterday afternoon and continued on through the night. Bleh, I guess I should have paid more attention to what the groundhog had to say about our spring forecast. Ok, enough of my whining. A while back I spotted this lovely fairy on Pinterest and after following the links back I found myself at Mo's Digital Pencil. Needless to say, I was smitten and had to get Fairy Mia right then and there. But since it was during the holidays she ended up just sitting and waiting patiently in my hard drive. That is, until the other day when I was high on a spring fever kick and a mission to show those neglected stamps (and digi stamps) some love. So I printed Mia out and started coloring her up to match this pretty floral piece of paper that is actually the packaging for some Prima flowers that I could never throw away. I tried to keep the colors very light and bright as I was going for a kind of sun-bleached look with her. Over all I'm pretty happy with how she came out and I LOVE how the yellow dress looks (the secret is adding some of my beloved E81 as the darkest shadow in the Y combo). Alrighty, I guess I should go get ready for driving to work in the snow... again... whine, moan, grumble... I hope it is sunnier in your neck of the woods! Yesterday was a pretty good day and I am happy to report that a Dove chocolate or two did the trick and I'm feeling right as rain. I was feeling so good in fact that I decided to take the time to film another 'start to finish' card making series. I got a lot of wonderful comments on the one I did last month so I'm thinking of trying to make it a monthly thing. The videos can be found here, here and here or over on Color Me Copic if you want to take a look-see. Well as much as I would like to stay and chat, it's time for me to go get myself ready for the day. My card is another quickie... though I did continue on my mini goal of inking up stamps that I haven't gotten around to using yet. 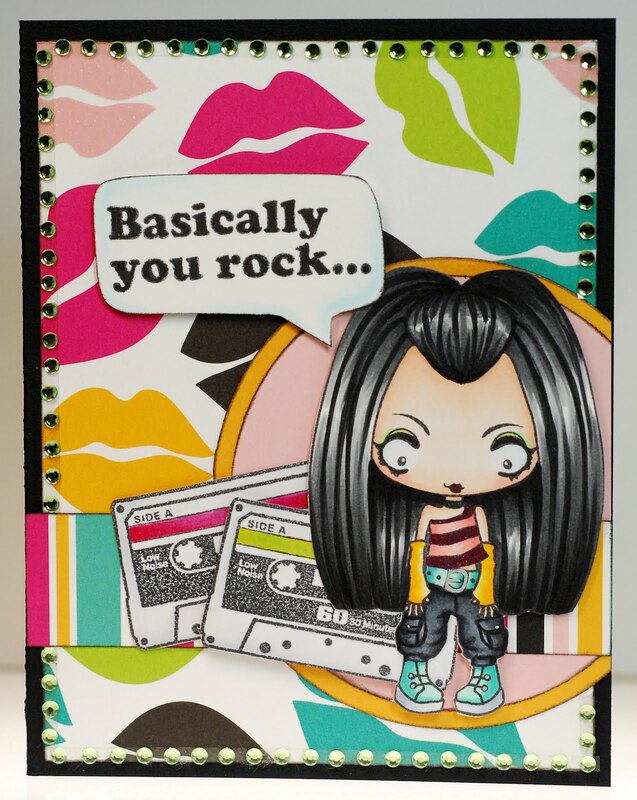 This time around I wanted to play with one of my newer Gorjuss Girl stamps and this darling girl with her massive head of hair was calling to me. Sitting images are always so much fun because I love how they can interact with the lines or layers of the papers you choose to use with them. Which in this case, is just a single sheet of paper as the background. But how cute is she resting atop that natural 'ledge' it created? Add to that a pretty flower, a little butterfly and some pearls and this card was complete! Alrighty then, time for me to sign off. Thanks for stopping by! I'm rushin' around like a crazy person this morning as I wound up sleeping in too long... yipes! So quickly, quickly let me share my card for the day. Yesterday was busy and I didn't have a whole lot of time to spend in the crafty room. When I finally got in there to relax a bit the Pure Innocence stamps where calling me. So I flipped through their binder until this little cutie caught my eye and since she hadn't been inked up yet, this seemed the perfect opportunity to get her on a card. Ok, I've really got to scoot my boot now! And see that little silver mushroom down there? It's actually from an old hair clip that I wore in high school. One got lost and this one broke off the clip and yet I could never bring myself to throw it away. 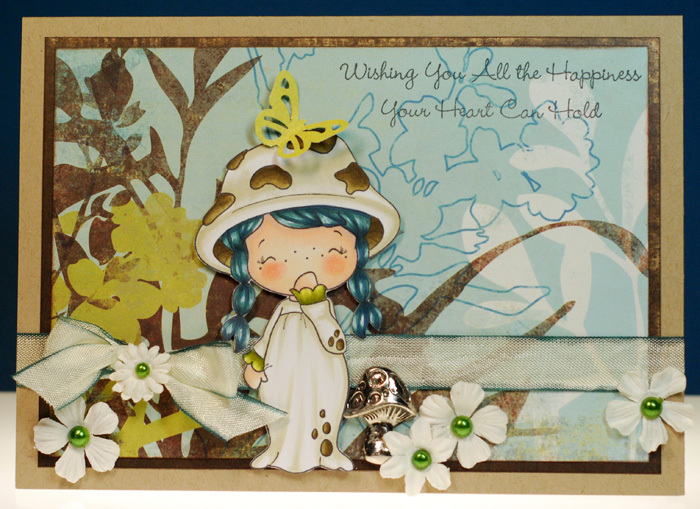 Now, all these years later, Mushroom Girl has a magical mushroom treasure to keep care off... yeah for hoarding, LOL! 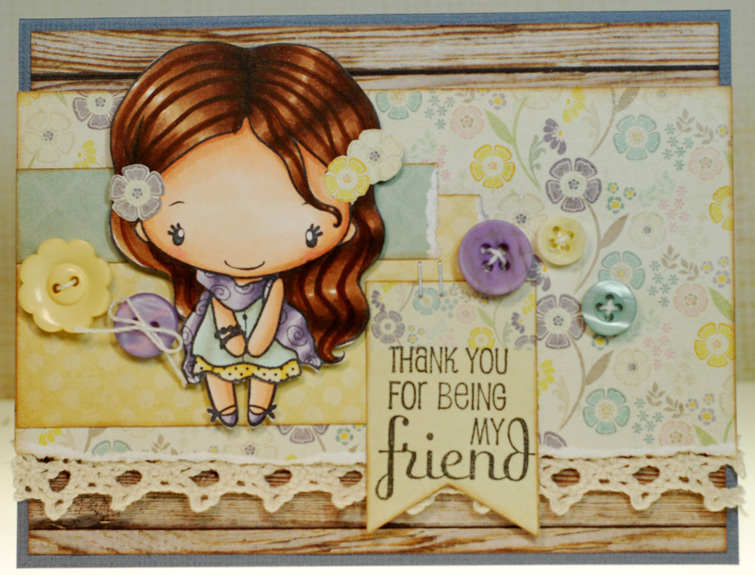 There is even more review preview fun and inspiration to be seen at ATS from my fellow teammies so take a moment to check it all out and all of the new February stamps can be found in the ATS store here! Hope you are ready to tackle a brand new week! Well, they have been sitting on my desk for awhile so I thought it was time to get another Madden on a card. You see, this isn't the first of the four Madden's that I've colored all up... the first one was actually published in the very first issue of the new Designed to Color magazine! If you haven't checked out DTC yet, I highly recommend that you do. 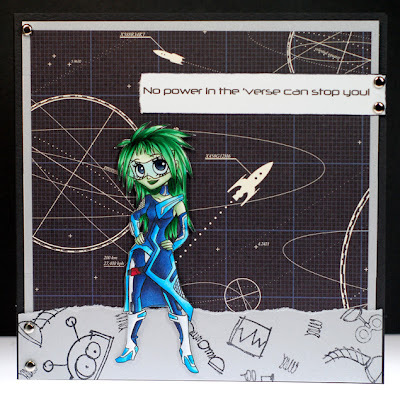 Carisa has been working hard to fill a void in our US paper crafting publications. 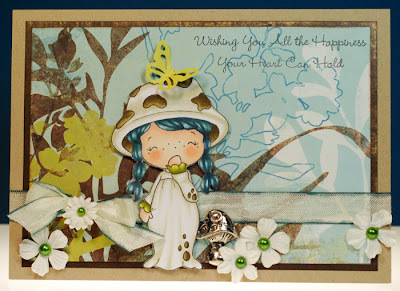 And I really hope to watch Designed to Color flourish and grow because in my opinion any sort of focus on coloring, character type stamps, and the cards and projects featuring them has been sorely lacking here in Stateside publications. Even in special 'stamping' editions of current magazines I've only ever seen stamping which requires little to no coloring... nothing even close to the kinds of cards that so many of us love to create. 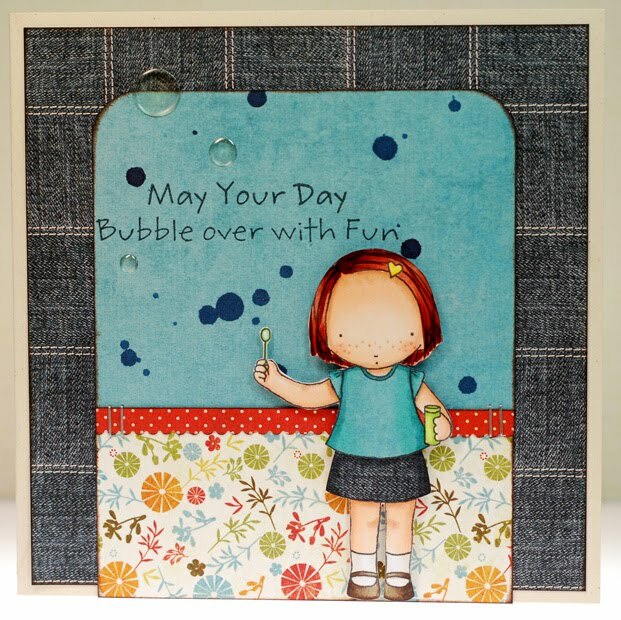 More often than not it seems that the published cards are only there to showcase the papers and coordinating embellishments that are currently available in stores. Which, yes, I understand that it is those paper companies paying the advertising dollars, but it is still disappointing when your area of crafting seems to be constantly neglected. Perhaps this little beauty helped to bring the sunshine my way... I like to think so anyway. I actually colored up this sweet Annabel the Mermaid stamp last weekend for a series of coloring videos that I did and I finally got around to putting her on a card. If you are interested in seeing how I colored her up, you can find the videos here, here, and here. 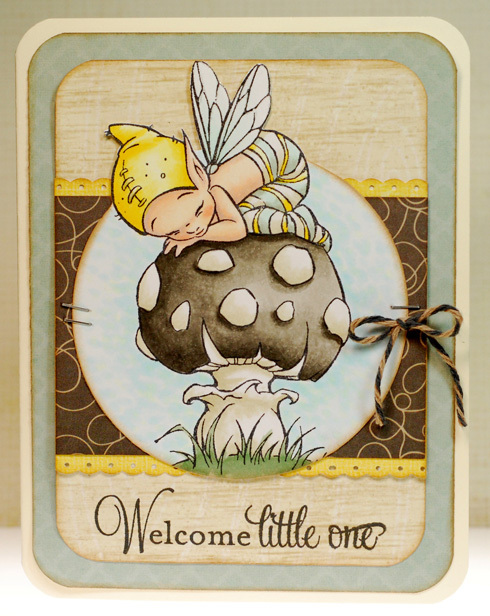 Or over on the Color Me Copic blog as well. Something about Annabel just made me think goldfish, I betting it's all of her ruffley fins... and I'm really happy with how she looks all decked in orange. On a completely separate note, I've been enjoying cruising around Pinterest and would love to find some new pinboards to follow and new inspiration. 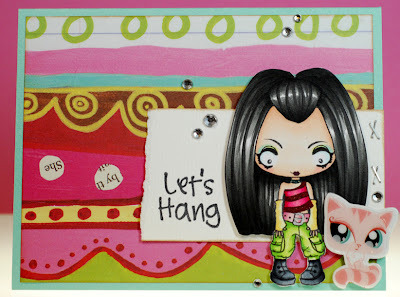 So if any of you fellow pinners want to leave me a link to your boards I will totally have a blast checking them out! So today is the day that the new Futuristic Lolitas and Lad digital stamps are available in the Tickled Pink store. Yesterday was the final preview over on the Tickled Pink blog, featuring Future Christina and I didn't want to forget to add her here too... even if I am a day behind. 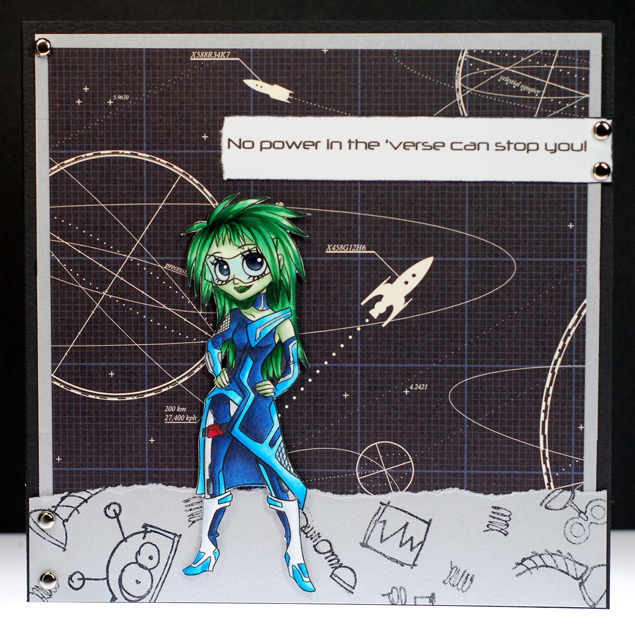 When it came time to color up this space age girlie I thought it would be fun to change things up a bit and make her into a super cool green hued alien chick! But no worries, she still stands on the side of all that is good and right in the universe protecting her fellow humanoids from the inevitable robot uprising. LOL, there I go again... these new images have definitely been bringing out my inner sci-fi geek this past week haven't they? Anywho, I've got a busy day ahead of me that I should go get ready for. 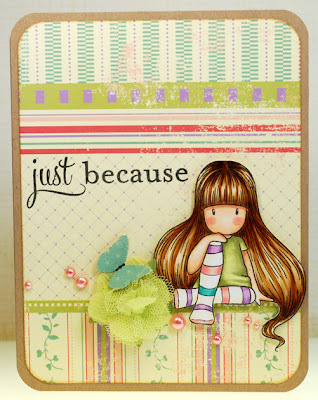 Today I'm jumping into the second day of previews at Sparkle Creations as a February Guest Designer with Karber Stamps! 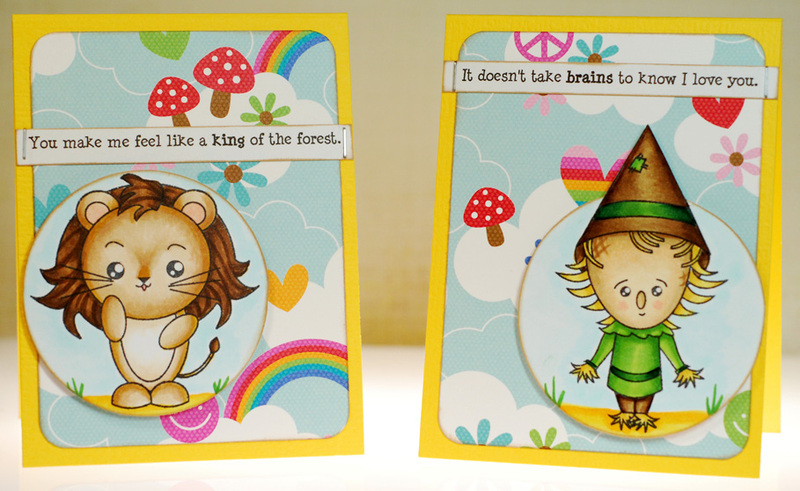 We are very excited to show you a brand new Karber Wizard of Oz set. 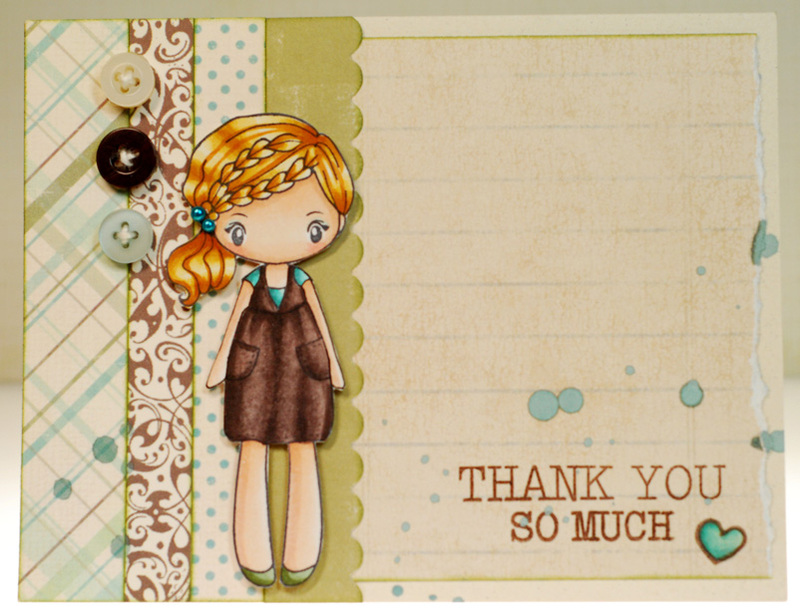 This is a clear acrylic set with 4 images and 2 sentiments. And all of the new stamps will be available to purchase from the SCRS store tomorrow! As soon as I laid eyes on these sweet stamps, I knew that I wanted to make a fun matching set of little Valentines with them. Each card base is cut to 3"x4" as I wanted these to have the look of the small Valentines I remember exchanging with friends in elementary school... plus the smaller size easily makes these little characters the star of the show. The Doodlebug paper with all of the rainbows was a must to pair with them and using it with the 'yellow brick road' colored cardstock really said Oz to me. 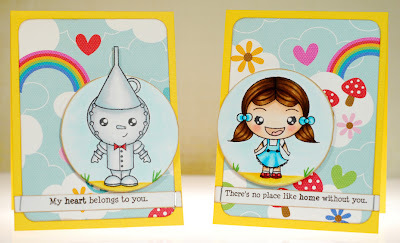 Then all I had to do was come up with some clever Valentine/Oz sentiments to go with each character and that was it! 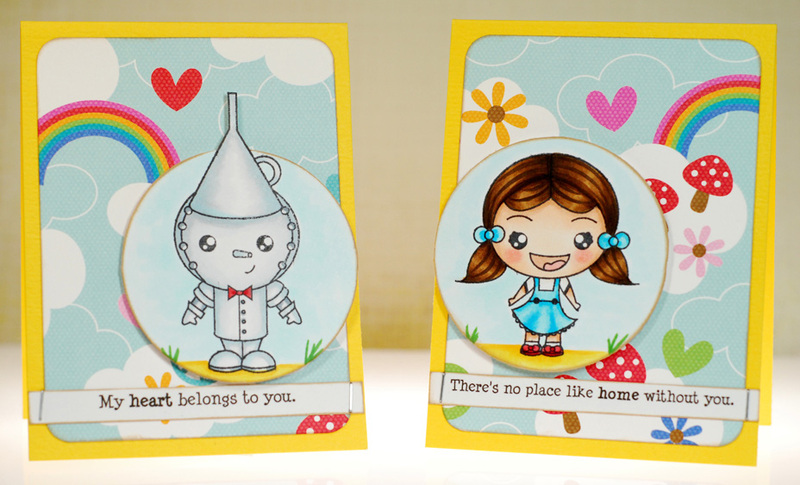 Now be sure to visit all of the fabulous designers for more peeks of Karber's Wizard of Oz set because Sparkle will be giving away a Karber Wizard of Oz stamp set to one lucky person! For a chance to WIN, you need to comment on all of the designers' Karber Wizard of Oz blog posts (links listed below) and then leave a comment under the post over at the SCRS blog. You have until midnight EST tonight to comment. Hey guys, we're still cruising right along at warp speed with the brand new Tickled Pink digital stamp release and this time the Lolitas and Lads have gone totally space aged! 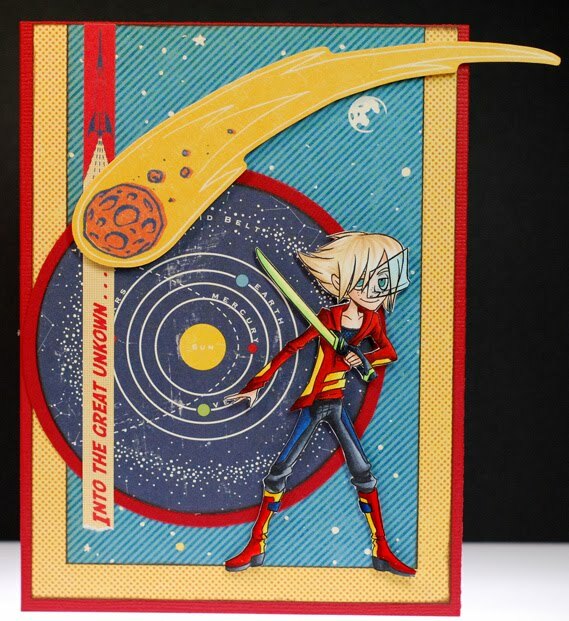 These images designed by Christina Dee are sure to set your phasers to stun-ning, LOL! I promise that you are going to love all four of the previews leading up to the release on February 11th (Feb. 10th for those of us in the States). Today Stefan is here to save the world from an alien attack! This brave space cowboy knows no fear and he travels through wormholes and asteroid fields with reckless abandon. Captain Kirk ain't got nuthin' on him, LOL! And after a fierce battle he always enjoys hanging out at one of the bars on Tatooine. As always it wouldn't be a Tickled Pink Stamps preview without a prize, so head on over to the Tickled Pink blog and leave a comment on today's post for a chance at winning your very own Futuristic Stefan digi stamp! 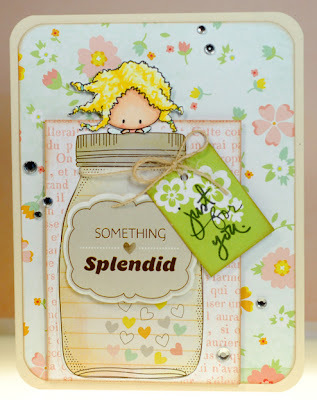 And while you are there be sure to check out the stellar cards that my fellow Pink Ladies have created too! We're going back... to the future!